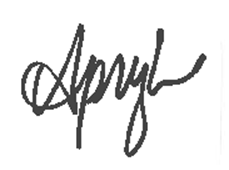 Happy National Donut Day from FotoBella.com! 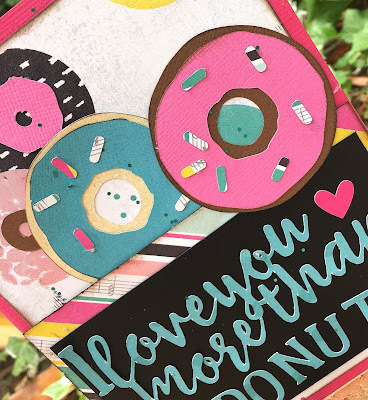 Apryl with FotoBella's Design Team here today with my "I love you more than Donuts" card made with Simple Stories Dance collection. 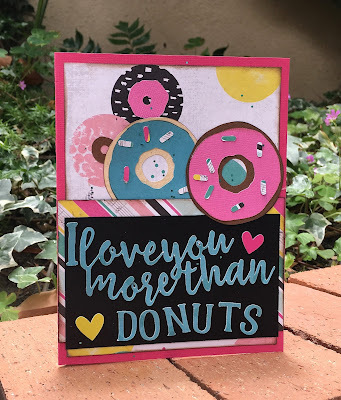 I chose a couple of designs to cut with my Cameo, the "I love you more than donuts" and the two donut shapes with sprinkles. The card background is made with the bright pink cardstock from the Dance collection with added layers of patterned card stock. I chose the circle patterned paper to go with the donut theme. I embellished with a couple of heart stickers and some glitter. This is a great card for any occasion and one that really makes you want a donut ;-) Grab a donut, visit FotoBella.com and get yourself the Simple Stories Dance collection.